4th year Pic 218 - Sep - 21 2012. 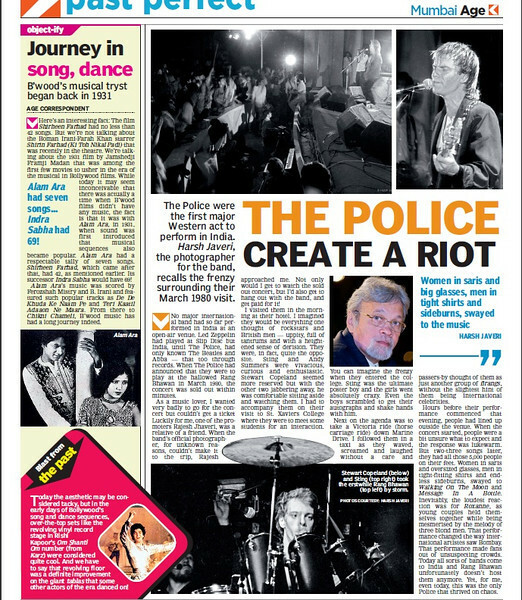 The Police create a riot - OK, this is not your regular shot of the day but hope you won't mind my sharing it here. This article appeared today in a national daily called Asian Age. The Police were an English rock band formed in London in 1977. For the vast majority of their history, the band consisted of Sting (lead vocals, bass), Andy Summers (guitar) and Stewart Copeland (drums). The Police became globally popular in the late 1970s and are generally regarded as one of the first New Wave groups to achieve mainstream success, playing a style of rock that was influenced by punk, reggae, and jazz. If anyone wants a PDF version of the shot can write to me. Well done! We didn't realize you were so famous! Congratulations on the publication of this article! Wow! What a piece of history! Congrats! "Don't stand so close to me..."
I had no idea you were the photographer for the band! That must have been quite an experience! Love this and the Police made wonderful memories for me and many more.